Learning takes place in multiple domains and at various degrees of complexity. 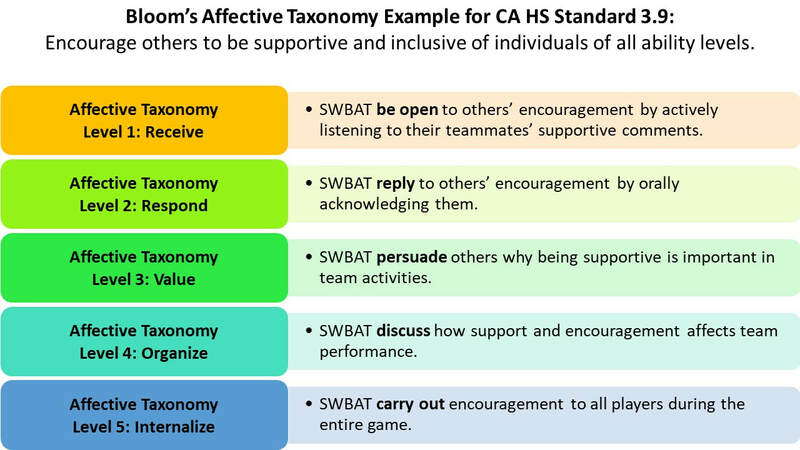 The Cognitive, Psychomotor, and Affective domains are widely accepted and you can also find support for the Social domain (Personal and Social Responsibility) and the Health Related Fitness domain. Also see Maslow's Hierarchy of Needs. 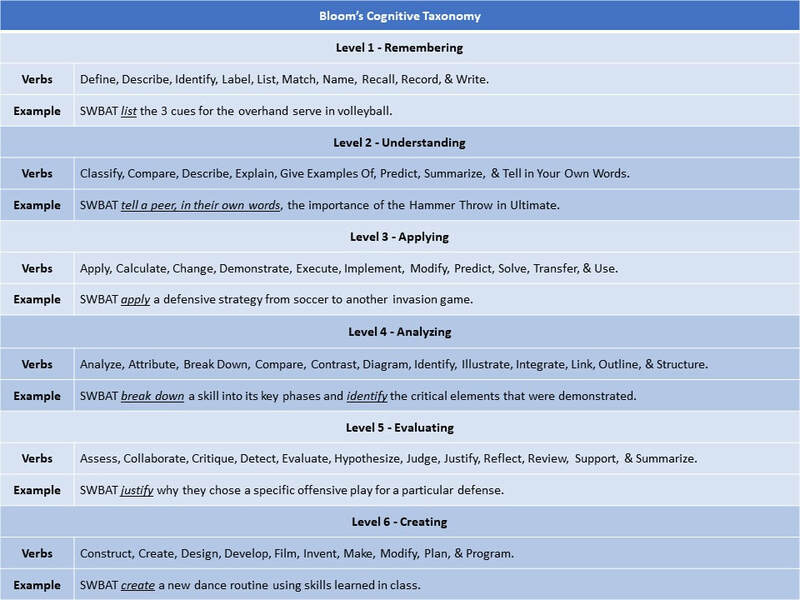 Cognitive Domain: knowledge and mental skills. Affective Domain: feelings, values, dispositions, attitudes, etc. 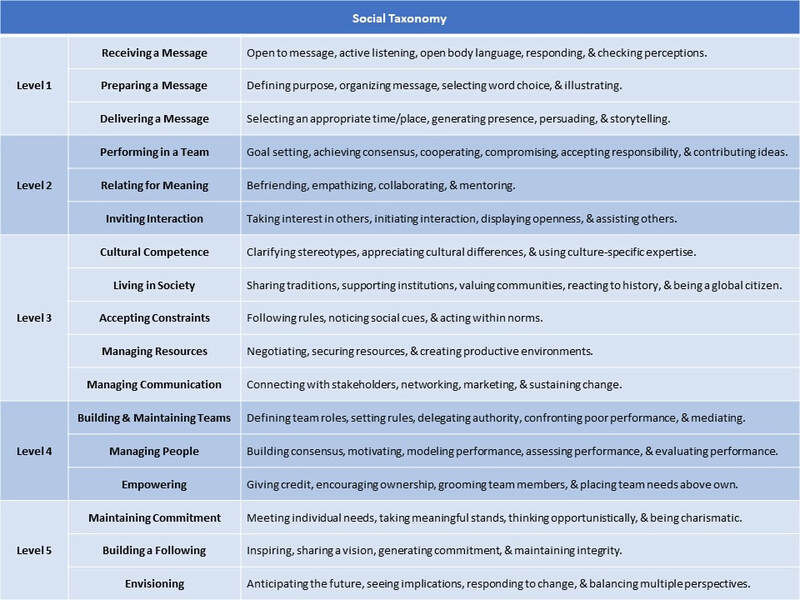 Social Domain: teamwork, communication, leadership, etc. 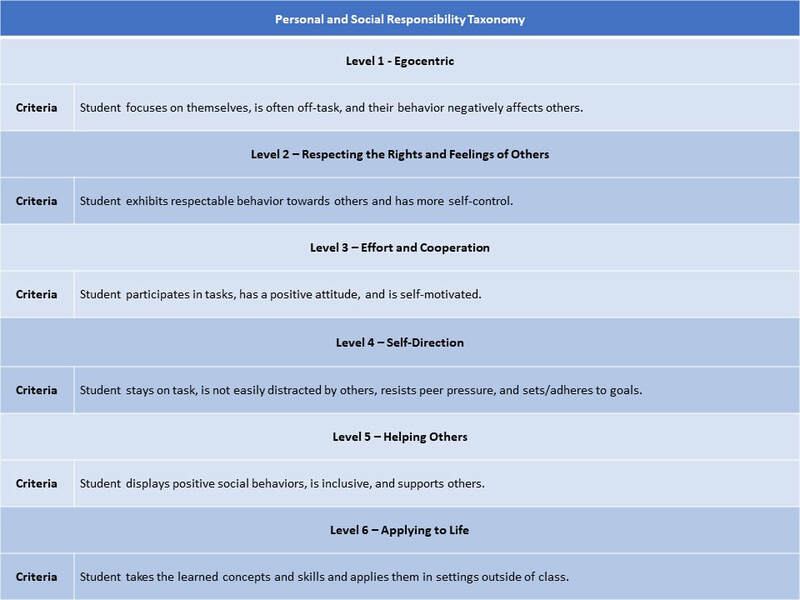 Personal and Social Responsibility: engagement in task and/or with others. Health Related Fitness: fitness level. 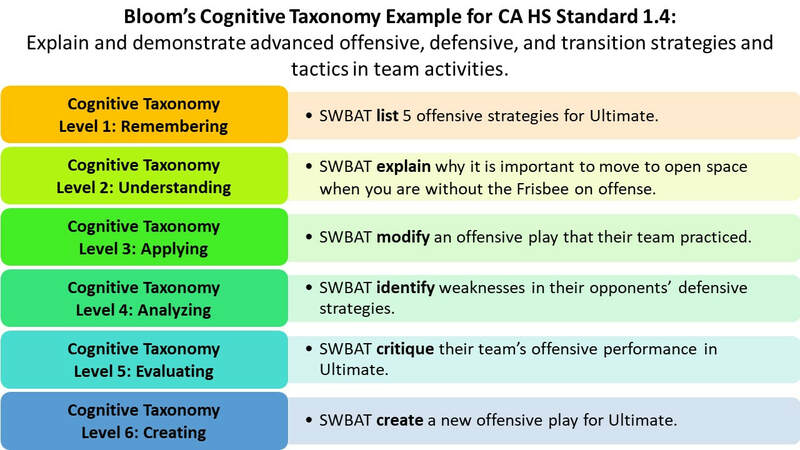 ​Use the tables on this page to help guide you in creating Student Learning Objectives, lessons, and assessments ("SWBAT" = Students Will Be Able To). The 3 images below show a progression from lower order to higher order for the psychomotor, cognitive, and affective domains. ​​Standard 1. The physically literate individual demonstrates competency in a variety of motor skills and movement patterns. ​Standard 2. ​The physically literate individual applies knowledge of concepts, principles, strategies and tactics related to movement and performance. ​​Standard 3. ​​The physically literate individual demonstrates the knowledge and skills to achieve and maintain a health-enhancing level of physical activity and fitness. ​​​Standard 4. ​​The physically literate individual exhibits responsible personal and social behavior that respects self and others. ​Standard 5. The physically literate individual recognizes the value of physical activity for health, enjoyment, challenge, self-expression and/or social interaction. ​2.6.3 The physical educator emphasizes critical-thinking and problem-solving tactics and strategies by using higher-order questions. 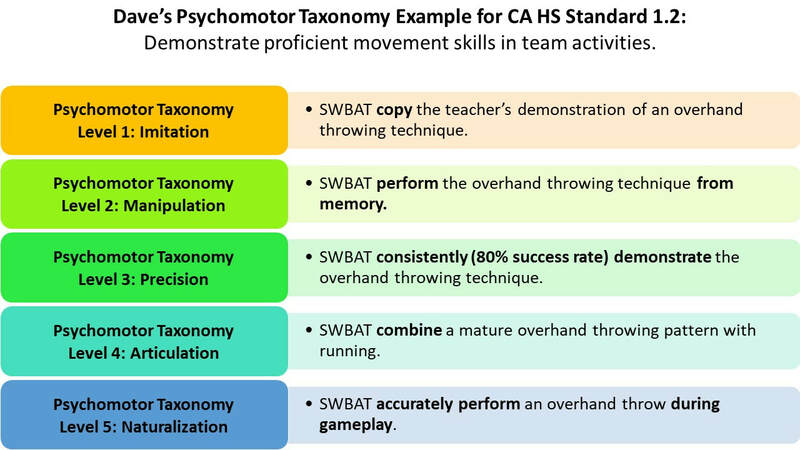 4.2.1 Physical educators systematically teach and assess all domains, using a variety of assessment techniques. 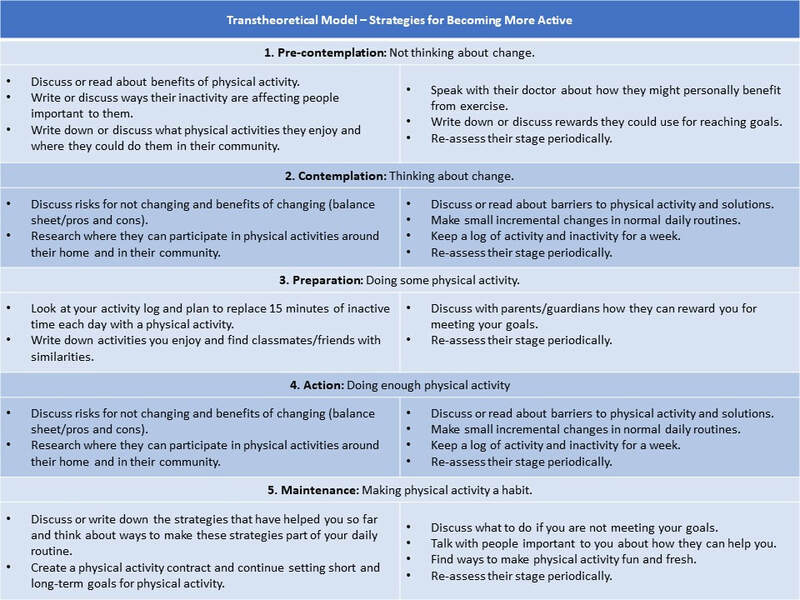 Adapted from: Teaching Physical and Social Responsibility through Physical Activity. Hellison, D.
Adapted from: Foundations of Sport and Exercise Psychology. Weinberg, R. & Gould, D. (2006).